Trang was never happy while she was growing up. Her father worked in another province and only came home once or twice a month, but his visits were always unpleasant. He would beat her mother and blame Trang for the violence. Being the only daughter in the family, everyone expected her to be gentle, intelligent, bright and respectful. Her whole life, Trang has been trying to please everyone in her family in an attempt to bring peace. She remembers a time when her father was in prison and her mother was so sick and was taken to the hospital causing Trang to stay with extended family. Fearing abandonment Trang would repeat to herself, “I have to be good; I have to be perfect so that they won’t leave me behind”. Not long after her mother was hospitalized, she was sexually abused by her uncles. She blamed herself at first and she couldn’t tell anyone because it would only give them a reason to criticize her. She thought that maybe she deserved it. When her father returned home, he began verbally abusing her causing Trang to have a panic attack. She knew she needed to get out of the house away from her father so she contacted Hagar Vietnam via the Hagar hotline. Hagar supported her with an emergency accommodation as a priority for her safety, and in due time, worked alongside her in addressing the issues that had caused her to leave. Hagar provided counselling and case management as well as a safe place to live. 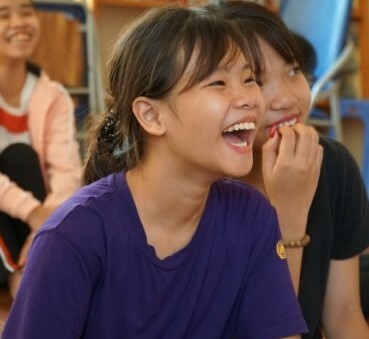 After counselling sessions with Hagar’s psychologist, Trang recognized the changes in her mental well being. It was never easy for her to share with others about her family and her problems because she felt she had to be the perfect girl, even in front of her closest friends. In her family home Trang experienced emotional and sexual abuse, and was a witness to regular domestic violence. These events wounded her and brought immense darkness into her life. At Hagar she could finally share her story. Now, she is finding hope in her ability to accept herself with all the darkness she’s faced and be able to move forward to a brighter future. Hagar’s staff in Vietnam continue to walk the whole journey with Trang.